Stochastic Gradient Descent is an optimization technique which minimizes a loss function in a stochastic fashion, performing a gradient descent step sample by sample. In particular, it is a very efficient method to fit linear models. As a stochastic method, the loss function is not necessarily decreasing at each iteration, and convergence is only guaranteed in expectation. For this reason, monitoring the convergence on the loss function can be difficult. Another approach is to monitor convergence on a validation score. In this case, the input data is split into a training set and a validation set. 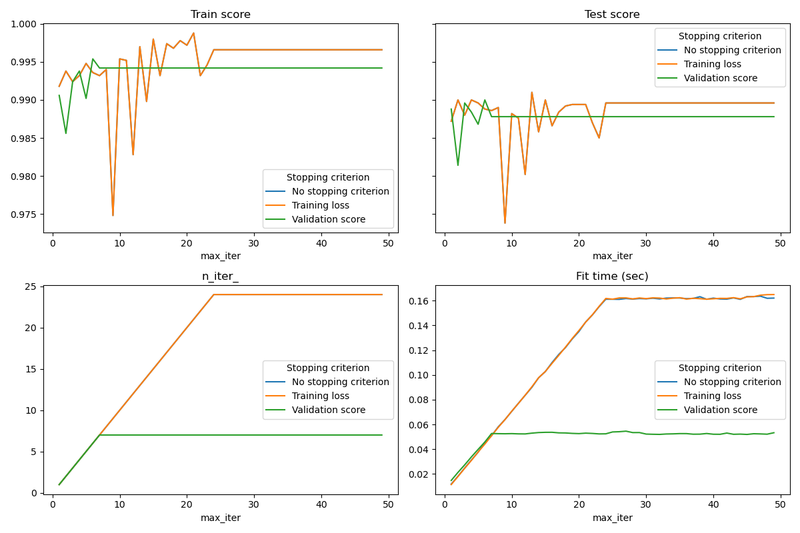 The model is then fitted on the training set and the stopping criterion is based on the prediction score computed on the validation set. This enables us to find the least number of iterations which is sufficient to build a model that generalizes well to unseen data and reduces the chance of over-fitting the training data. This early stopping strategy is activated if early_stopping=True; otherwise the stopping criterion only uses the training loss on the entire input data. To better control the early stopping strategy, we can specify a parameter validation_fraction which set the fraction of the input dataset that we keep aside to compute the validation score. The optimization will continue until the validation score did not improve by at least tol during the last n_iter_no_change iterations. The actual number of iterations is available at the attribute n_iter_. This example illustrates how the early stopping can used in the sklearn.linear_model.SGDClassifier model to achieve almost the same accuracy as compared to a model built without early stopping. This can significantly reduce training time. Note that scores differ between the stopping criteria even from early iterations because some of the training data is held out with the validation stopping criterion. """Load MNIST, select two classes, shuffle and return only n_samples.""" """Fit the estimator on the train set and score it on both sets"""